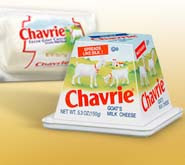 Go here to get a coupon for free Chavrie Goat Cheese. Awesome! Coupon will arrive in 6-8 weeks. I've never tried goat cheese, but I'm not much of a cheese eater.